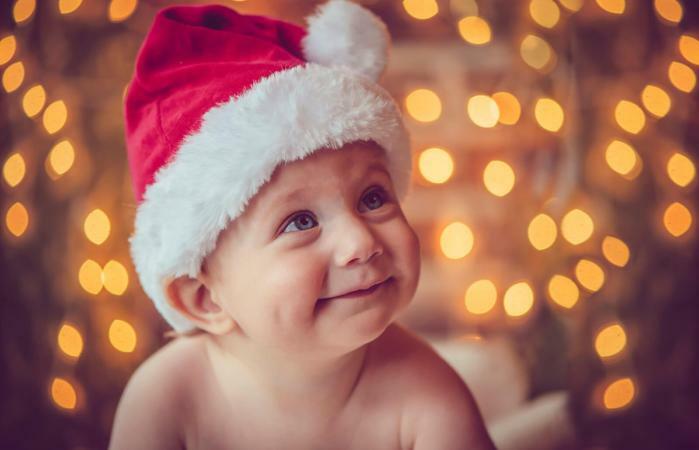 Celebrating the holidays with a special outfit for baby's first Christmas is a wonderful way to kick off the festive season. Christmas is a time of rejoicing with family and friends, and the addition of a new family member makes it more memorable. Whether you are shopping for your baby or someone else's, there's a wide array of styles and options from which to choose. It can be lots of fun dressing little boys up in three-piece suits with bow ties and shiny, black shoes, however, that fancy outfit may not be comfortable after a few hours of wear. Fortunately, you don't have to sacrifice cuteness for comfort because there are many comfortable Christmas outfits for boys. Boys 5-Piece Knickers Set with Red Plaid Vest, Dress Shirt, Bowtie and Newsboy Cap: Your baby boy will look darling in this Christmas-themed outfit. 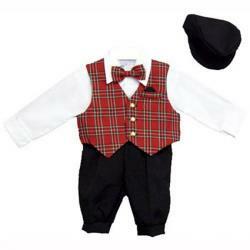 It includes a white dress shirt, red plaid vest with matching bowtie, and black pants and cap. It is available in sizes 6-24 months. It retails on Amazon for under $45 for the complete set. Customer reviews mentioned it looks good but runs small so you may want to order one size larger. Baby Boys' 'Santa's Cookies' 2-piece Set: This outfit is 100% cotton. The grey printed onesie says, "I Ate All Santa's Cookies #NoRegrets". The matching grey and red striped pants have a little gingerbread man peeking out of the pocket. It ranges in size from newborn to 12 months. It can be found at Target and retails for $9.99. Baby Boy Christmas Romper: This outfit has a unique, vintage design and classic style. This one piece baby boy romper is green and white striped and has a beautiful applique Santa on the front in contrasting colors. It also comes in red stripes with applique and can be personalized with your babies name. The sizes range from preemie to 4T. This outfit can be found on Etsy and costs $39.50 and up. 2-Piece Snowman Onesie & Hat Set: This is a 100% cotton, long-sleeve 2-piece outfit. It is white and has a screen-printed snowman cut-out with a scarf and button graphics on the onesie and a snowman face on the hat. The available sizes range from newborn to 24 months. It can be found on Carters online and retails for less than $10.00. The selection for girls' first Christmas outfits is broad with styles ranging from dresses to two-piece pants outfits, to dressy overalls, and onesies. Satin, silk, velour, velvet, and cotton are all good fabric choices for an infant's Christmas dress. Consider a style featuring lace trim or some other embellishment such as smocking or embroidery as a trim. Baby Girls 'My First Christmas' Santa Costume Party Dress: This is a four-piece outfit that includes a onesie flouncy dress, a pair of shoes, a pair of leggings and a headband. There are 13 different options to choose from, each one cuter than the next. You have your choice of Santa, a stocking, a Christmas tree, and a reindeer just to name a few. It has a tutu-style skirt with leggings, shoes and a headband to match. The size ranges that are available are 3 to 18 months. This outfit can be found on Amazon and retails for $19.99. Baby Girls' 2-pc Faux Fur Shrug and Jacquard Dress Set: This 2-piece set includes a snowy white, faux fur shrug and a brilliant red, A-line, cap-sleeve, jacquard dress with a red bow along the waist and matching satiny red diaper cover. This is definitely for the chic, classy, fancy baby girl! The size range is from newborn to 18 months and can be found at Target for 17.99. Baby Girl Christmas Outfit: This outfit is beyond adorable. There is a 'Santa Baby' onesie and red and black buffalo plaid high waisted pants. They are made from high quality, super soft fabric. There are different options/colors to choose from as well. The sizes range from newborn to 24 months. This outfit can be found on Etsy and retails for $17.00. Baby Girls' Christmas 2-Piece Peplum Bodysuit Set: This Christmas outfit is crafted in 100% certified organic cotton. It is a 2-piece Christmas set and is extra soft on baby's skin. There are sweet penguins embroidered on a peplum bodysuit with coordinating pants. The sizes available are 18 months and 24 months. This outfit rates high on the cuteness scale! It can be found at Carter's online and costs just over $10.00. Baby's My First Christmas Ugly Sweater: For those who love the 'ugly sweater' phenomenon and want their baby to partake, this is for you! It's actually not that ugly and is really quite cute. The sweater is green and red and covered in zigzags, diamonds, and snowflakes. The words "My First Christmas" are stitched in white and shimmery gold thread. It's easy to pull over your little one's head. It looks great with jeans, baby leggings or any other bottoms. Sizes range from newborn to 6 months. It can be found at Target and is priced just under $20.00. 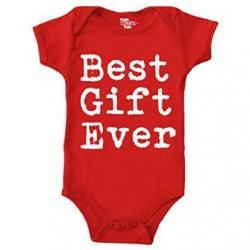 Best Gift Ever Christmas Bodysuit: Let everyone know you've received the "best gift ever" this Christmas when you outfit your baby in this cute bodysuit. The top is accented with the slogan and features a snap closure bottom. Pair it with a pair of coordinating pants for a full outfit. Available sizes range from newborn to 24 months. It can be found on Amazon and retails for about $14.00. Gender Neutral First Christmas Outfit: This is an adorable, personalized, red infant bodysuit with red and green leggings and a matching hat and headband. The sizes range from newborn to 18 months. This outfit can be found on Etsy and costs about $11.00. Two-Piece Elf Bodysuit: Your favorite boy or girl elf will look super festive in this green, screen-printed, long-sleeved elf suit. It has a matching elf hat with sherpa trim and a pom pom. It's available in sizes newborn to 24 months. It can be found at Carters and retails for under $10.00. It's a good idea to balance your desire for going all out with lots of ribbons, bows, and embellishments with your child's need for comfort. Whether your baby is a newborn or nearly a year old, you'll want to combine style with practicality. Choosing fabrics with soft textures helps minimize irritation to a baby's sensitive skin. Cotton, cotton blends, brushed velours and other soft, drapeable fabrics make comfy outfits that are stylish, too. If you aren't sure how your child's skin will react to the chosen fabric, do a test run and let him wear the outfit for a short time in advance of parties or other celebrations. If you notice signs of irritation, or if your baby fusses or seems uncomfortable, you might want to rethink that particular outfit. The economics of Christmas outfits is they are generally worn only a few times because children outgrow them quickly. This means secondhand outfits are typically in almost-new condition. Your best chance of finding a bargain is by browsing local or online kids' consignment shops, thrift stores, seasonal sales, or online auctions like eBay. Enjoy your search for that perfect first Christmas outfit. Remember, you'll never buy this baby another first Christmas outfit, so make it special and take lots of pictures to preserve the memories.